As you start to buy roses from mail order nurseries, and even some local ones, you are going to encounter both these terms. You’ll want to know a little about the differences so you can make an informed choice. Own-root roses are roses struck from cuttings. This means the roots are the same variety as the rose above the ground so it can never “change” by suckering. This begs the question, if this is the case then why weren’t all roses own-root roses? Certainly would have saved a lot of work tearing out those Dr. Huey roses! There is a simple answer. Many florist and exhibition roses aren’t vigorous enough to grow on their own roots. They stay puny and eventually die. Hardly a Garden Rose! Along with disease resistance we feel being able to grow vigorously on its own roots is another important characteristic of a Garden Rose. 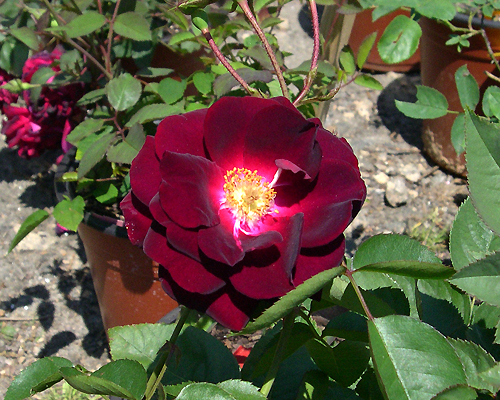 Plus own-root roses make fuller, bushier plants and constantly put out new canes from the base. They make Garden Roses. For this reason we recommend you purchase Garden Roses on their own-roots. How do you know if it’s an own-root of grafted rose? Ask whomever you are buying it from. If they don’t know then run away and find someone who knows what they are talking about! After you view the video we suggest you go to Part 5 of Roses 101. Here is a short video showing what we’re talking about.